When I hear the word missionary, the first image in my mind is someone traveling and toiling in a far-off land, trying to preach Christ to those who have never heard of Him before. But the reality is that there are so many people in our neighborhoods, in our schools, in our places of employment, that are spiritually starving for Jesus Christ and His Church. We are each Christ’s missionaries in our daily life. In August, we celebrated the memory of someone who was an incredibly dedicated missionary to his own people, St. Kosmas Aitolos. Below I include his life. 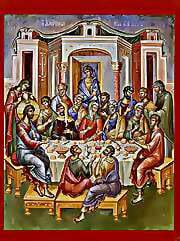 Through the prayers of St. Kosmas, may we all learn how to offer Jesus Christ to our friends and neighbors that are seeking Him. The holy, glorious and right-victorious New Hieromartyr and Equal-to-the-Apostles Kosmas Aitolos was born in 1714 in Mega Dendron, Aitolia, Greece, to a father who was a weaver and a devout mother. He attended public schools, but was tutored by an archdeacon. He taught and then attended a school on Mt. Athos. He became a monk and later a priest at Philotheou Monastery where he remained for two years. After a time, he felt a calling to do missionary work in Greece, especially in the remote areas where there was a lack of churches and priests for the many unbaptized adults. As an aftermath of four centuries of Turkish oppression in Greece, St. Kosmas received the patriarchal blessing in 1759 to travel wherever needed, for however long, with complete independence, to breathe life back into Christianity in Greece. St. Kosmas travelled in Greece, its islands, and Albania for 25 years, founding over 200 schools, as well as charities and rural churches. He travelled by foot, by donkey and by ship. When he came to a village he would ask the villagers to plant a large wooden cross in the village square. Then he would mount a bench next to the cross and preach to the villagers about the love of God and the Orthodox faith. The Turks tried him on charges of conspiracy and sentenced him to hang in August 1779 in Albania. Patriarch Athenagoras glorified him in 1961. ← Corn One… Corn All! !